Dream of swapping your '99 Fiesta for a hi-tech BMW? Course you do, but money doesn't grow on trees. Fortunately though, a new gadget is on the horizon that will bring infotainment to your old rust bucket. 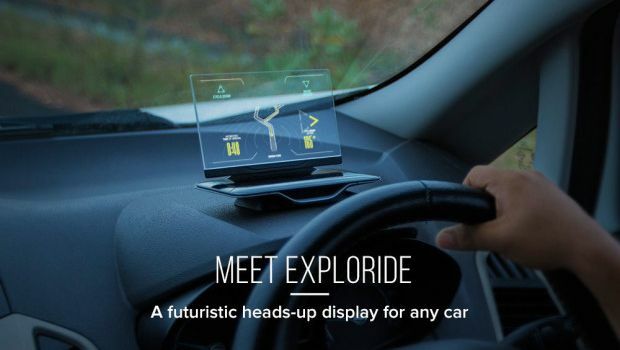 Exploride is a portable heads-up display that you can use in any car. Like the ones you see pre-installed in flashy estate cars, it gives you access to maps, music, calls and texts. It also features gesture controls to navigate the menu, which is much safer than reaching over to press the screen. It takes infotainment systems, sat-navs and smartphones and combines them into one all-round system so you're not having to divide your attention. Wisely, Exploride didn't try and keep it all in-house. The maps are powered by Google Maps, and you can stream music through Spotify and Pandora. Although it does have its own app that lets you access files from the cloud as well as a dash cam for recording anyone who tries to key your car. It also serves up data including health, fuel status and more. It also doubles as a 4G hotspot so your passengers can get online using Wi-Fi without having to burn through their data. Design-wise it rocks a futuristic 6-inch transparent display. Swipe up, down, left and right to control it, or you can speak and use voice controls. Inside is a quad-core processor, 2GB of RAM and Bluetooth 4.0 LE. It also sports a 12v multi-USB adaptor and high output speakers. Before you scour the net, Exploride isn't on sale just yet. It's about 52 per cent on its way to its $100,000 goal and should start shipping in January for $269 (£171). In the meantime, you can find more information here.